Before television hillbillies arrived on the scene much of the non-hillbilly world knew very little about these elusive people. I mean, have you ever seen National Geographic go film any crazy hillbillies? 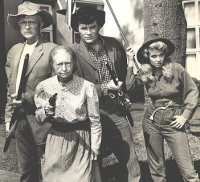 The most well known hillbilly show, of course, was the Beverly Hillbillies. Many other fine educational programs designed to inform the world about the fine points of hillbilly life were produced over the years. Millions of people learned what a hillbilly was and how they behaved while they sat in front of their TVs. It was educational programming for the non-hillbilly (hillbilly challenged?) which presented a true life picture of hillbilly behavior. Great educational classics such as Li’l Abner and Ma and Pa Kettle paved the way for a brighter future for humanity by providing the world with a historically and culturally accurate depiction of the hillbilly in his (or her) native habitat. 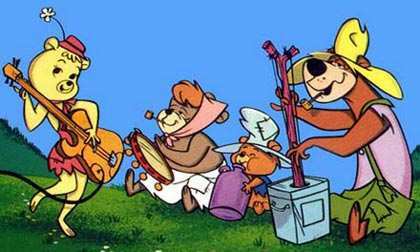 In the 1960s Hanna Barbera introduced the Hillbilly Bears. It was felt that most of the hillbilly educational programs were aimed toward older audiences so the cartoon couple took upon themselves the task of helping the non-hillbilly children of the world learn about real hillbilly life. The Hillbilly Bears was instrumental in the success and advancement of our great nations project to help non-hillbilly children laugh and learn as much as the grown ups. Thanks to Hanna Barbera children no longer had to wait until they grew up to learn how crazy hillbillies are. Well, if you have read this far you may be thinking, “what a jerk!” Rest assured that I am only kidding, but the fact is that millions of people did watch the Beverly Hillbillies and shows like it and they did come to think that what they saw was representative of how hillbillies were in real life. This was too true for a lot of my cousins who lived in Ohio (that foreign land on the other side of the river). This has been a facetious look at stereotypes and hillbillies has been brought to you by the makers of Possum Treat. Possum Treat is made with real lard which will make those trips to the outhouse a joy. Remember, Treat is a treat, but Possum Treat is livin’ high on the hog! Try some Possum Treat today! 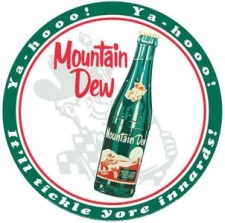 That reminds me, in the sixties, Mountain Dew was introduced and the ad campaign ( pre Beverly Hillbillies ), was purely stereotypical, an animated little hillbilly, with a beard and old beat up hat, rifle, torn overhauls and barefoot and a would run up and down these cartoon hills yelling “YAHOOO!, MOUNTAIN DEW! and there may have been another slogan I can’t remember, if anyone out there knows send a comment. Don’t forget Green Acres, they had some the best characters, Haney, Eb, the Ziffles, Mr. Kimble and so on. And Green Acres and Petticoat Junction were Beverly Hillbillies spinoffs. There are also those robot Hillbilly Bears at Disneyland who’d drink from jugs of shine and play music and some are just plain goofy. Sort of like an “Otis” bear, and lets not forget theres Mayberry and Gomer and Goober, and who but a hillbilly would name a kid Opie! 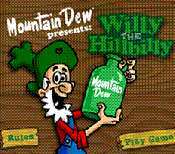 Is this the Mountain Dew Drinkin Hillbilly you’re tawkin bout? Yep, thars’ that rascal! Ol’ Pappy. Look what a jug! See that bullethole in his hat! Fuedin’ agin. The Possum Treat was the best! Where can I buy that? Licking lips…can I order one of the ABSOLUTELY free ones??? Where you pay the shipping costs…or not? The only thing the Beverly Hillbillies was missing….ME!! Think of it, I’d have Granny around to learn from , you know, teach me her womanly ways. Cookin, cleaning, shootin people [or at least at them] and making lye soap. Now then, theres Jed. Whoooo dooogies, what a man! Gittin to be married up with him wouldnt be unbearable.Big strong strappin man, why he c o u ld…uh, never mind. Havin Jethro as a son would be doable. Never open a jar myself agin,……I guess thats it. Ellie Mae could learn a thing or two from me, like what kind of guy NOT to pick, no, really. Jane Hathaway could use a PDA, if I was married to Jed, Id buy her one. Does anybody remember “Granma’s Lye Soap”? It was “In The Book”.